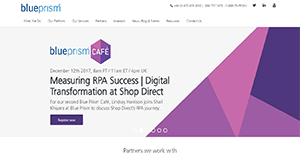 Blue Prism is an innovative RPA platform that enables companies to manage and deploy their digital workforce composed of software robots. These bots are flexible, adaptable, trainable, and dependable and work consistently on their assigned tasks. With Blue Prism, redundant tasks are automated and are continuously done by a workforce that does not take days off. This enables the human labor force to channel their energies towards more complex operational challengers instead. Blue Prism is also user-friendly, easy to set-up, and promises bank-grade security to enterprises utilizing it. On top of that, the platform is a scalable one that matches the pace of businesses as they transform and grow to face their challenges. Blue Prism connects enterprise technologies like AI, machine learning, and sentiment analysis to enable companies to create efficacious digital business strategies. This lets them deploy their approaches from a secure platform and at a fast pace, making their operations agile. With Blue Prism, businesses can look forward to intelligent automation of their business processes. This allows their workforce to productively work together, letting them do more in a short span of time. Blue Prism is an easy-to-use software. A feature that makes it so is its user interface that supports several languages like Japanese that enables users who speak and read languages other than English work comfortably with the application. Further, Blue Prism offers unparalleled insights into business operations through third-party tools. This lets businesses create new strategies based on accurate data curated specifically for them. Business intelligence is an important aspect of a company and securing it is critical to a commercial entity’s success. This is something Blue Prism understands and that is why it boasts multiple levels of security when it comes to user permissions that segregate roles and access. Moreover, Blue Prism integrates with credential vaults, applications that let companies store their authorization credentials securely within the platform. This way, they can make certain they users always have access to data they need without compromising security. Blue Prism now sports an improved administration console where executive and administrative users can control resources and settings. On top of that, the application can run both on-premises and in the cloud via Microsoft Azure and Amazon Web Services, providing companies with flexible infrastructure choices. If you are interested in Blue Prism it may also be beneficial to investigate other subcategories of Best Artificial Intelligence Software gathered in our base of SaaS software reviews. There are popular and widely used applications in each software category. But are they essentially the best fit for your company’s unique wants? A popular software product may have thousands of customers, but does it offer what you need? For this reason, do not blindly invest in popular systems. Read at least a few Blue Prism reviews and think about the factors that you want in the software such as the cost, main features, available integrations etc. Then, select a few solutions that fit your requirements. Check out the free trials of these platforms, read online reviews, get explanations from the maker, and do your homework systematically. This in-depth homework is sure to assist you choose the finest software platform for your company’s special requirements. How Much Does Blue Prism Cost? We realize that when you make a decision to buy Artificial Intelligence Software it’s important not only to see how experts evaluate it in their reviews, but also to find out if the real people and companies that buy it are actually satisfied with the product. That’s why we’ve created our behavior-based Customer Satisfaction Algorithm™ that gathers customer reviews, comments and Blue Prism reviews across a wide range of social media sites. The data is then presented in an easy to digest form showing how many people had positive and negative experience with Blue Prism. With that information at hand you should be equipped to make an informed buying decision that you won’t regret. What are Blue Prism pricing details? What integrations are available for Blue Prism? If you need more information about Blue Prism or you simply have a question let us know what you need and we’ll forward your request directly to the vendor.